Best looking car yet, from Tata is what i would say. 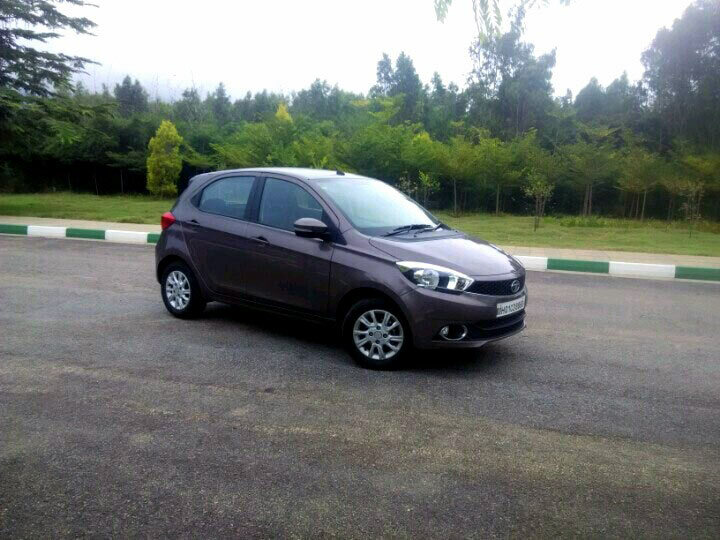 Tata Tiago has a design which attracts the younger audience and its something which will not be ignored. Piano black finish front grille with the chrome Tata logo on it stands out. The base of the front grille has a chrome finish underline which works well with the front end of the car. 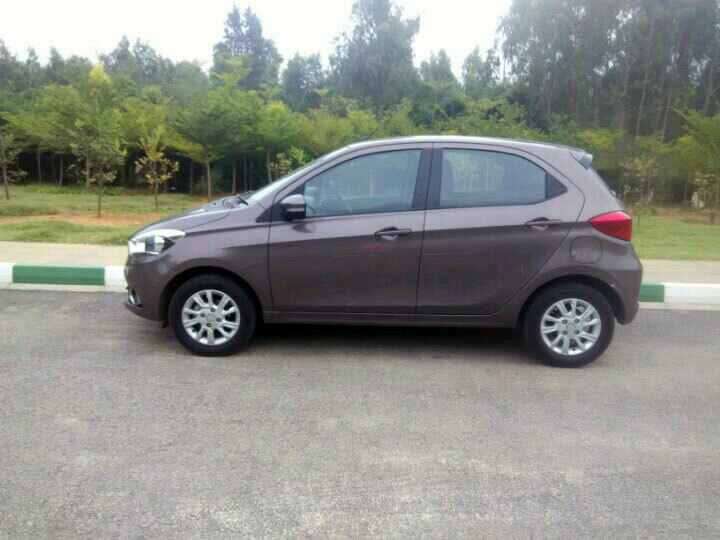 The top end variant (XZ as here) has body colored front bumper which houses the fog lamps neatly. Side profile of the car makes you feel like you are looking at a proper Asian hatchback. The shoulder line stretching all the way until the tail gives it a long car feel. Tiago gets LED mirror indicators which add to the look of the car. As you walk towards the rear end of the car you can see the wrap around tail lights which kind of protrudes out of the car giving it a wider look. Tiago also gets airbags and ABS. On the inside it gets body colored AC vents which gives you the sense of the color of the car even on the inside of it. I loved the way the center console was housed in the middle with a piano black finish to it. The chrome outline for AC vents gives a premium look to it. Although the quality of chrome plastic used in the car could’ve been better, inside door knobs have a chrome finish too but the plastic feels like it would fall off anytime. 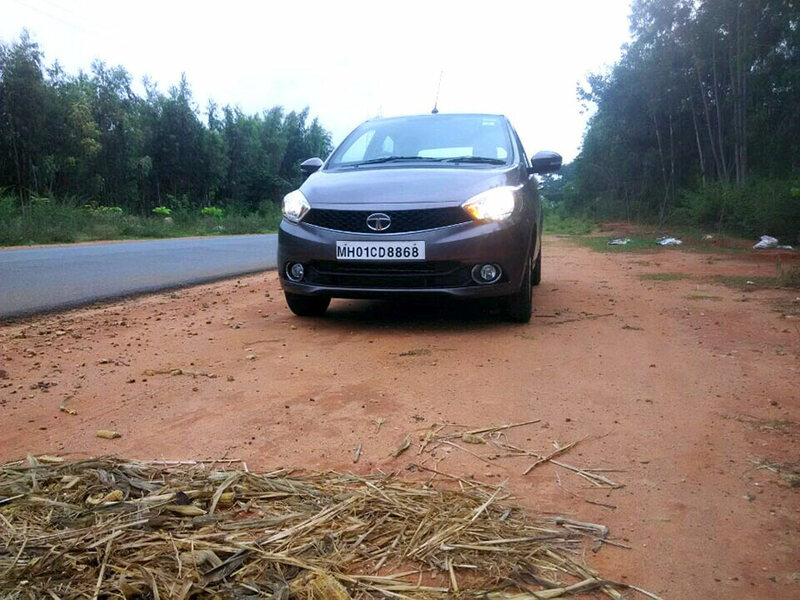 Get Tata Tiago for Test Drive! Provide your details so that we can arrange a test drive of Tata Tiago for you at your city! Tiago gets a very impressive music system by Harman and its the best system you could get in this segment. I didn’t like the way the speakers were integrated on the upper part of rear passenger doors of the car. The quality of the front dash is pretty good and it lacked the co-driver mini storage space which comes above the glove box. Tata has used two qualities of plastic in the car. The top layer dash quality is nothing like anything seen on any of the Tata cars and feels great but the lower dash feels completely out of sync. Co driver cup holders are not present but a common cup holder is present behind the gear lever of the car. The buttons on the console are of good quality and easy to operate and the steering mounted controls are a great advantage. It does not get a touch screen console. Tiago lacks the rear AC vents and would’ve proved a great deal if it housed it in. Rear boot comes at 242 litres and its not a bad deal at all. Parking sensors come in handy as well. Tiago, as mentioned earlier, lets you choose from the petrol or the diesel. 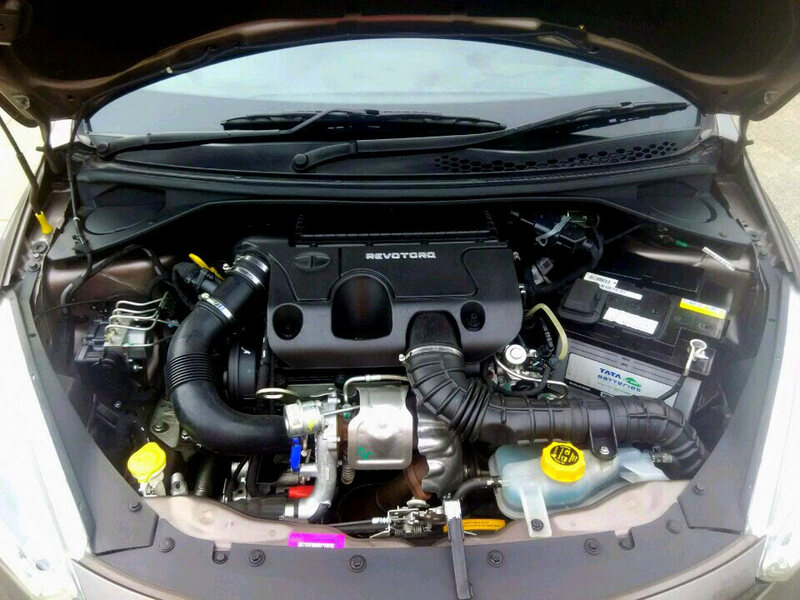 Petrol has a 1.2 litre Revotron engine which gives 85hp of max power and makes 114 Nm of torque. The diesel on the other hand has a 1.05 litre Revotorq engine making 69 PS of power and 140 Nm of torque. The max torque is delivered from 1800 – 3000 rpm. We have had the diesel car with us for a few days.The moment you step on the throttle you notice the slight lag which doesn’t disappoint you after the turbo kicks in. Early shifts will leave you begging for power. 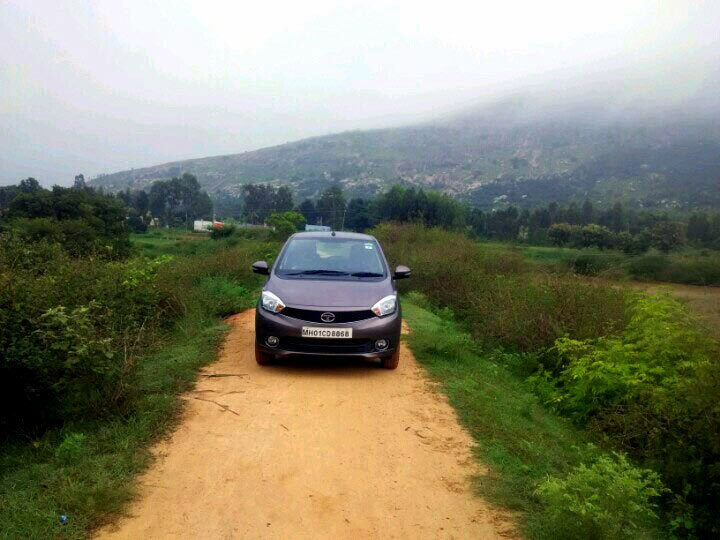 The Tata Tiago was designed to be an everyday car and that’s what it does best. It gets two driving modes, City and Eco. The engine noise is not as much as you would expect from a Tata diesel. Steering feels smooth and very easy to use while driving around in the city. Very impressive gear box which will not let you struggle at all. Shifts are really smooth. Steering lacks feedback at low speeds and as you step on the throttle and reach about 100 km/hr the steering feels good and heavy and gives good feedback. I could manage a top speed of 145 km/hr and the car didn’t struggle much doing so. 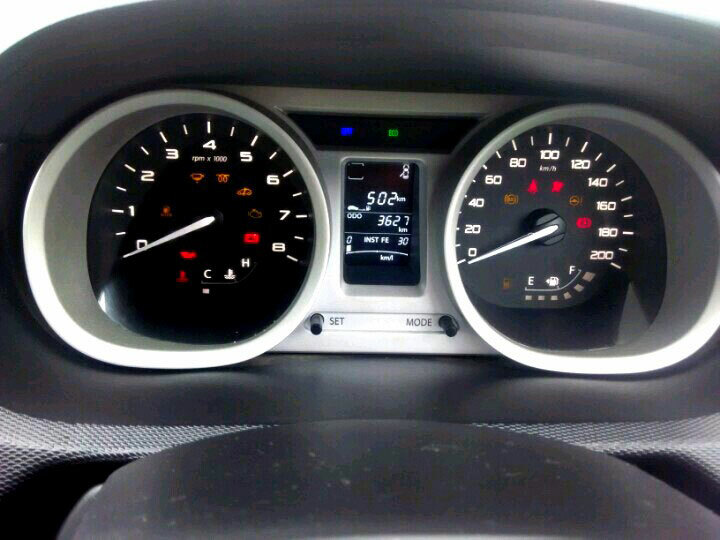 Tiago gave me an impressive overall mileage of 24kmpl. It gets an independent suspension with McPherson strut setup up front and a semi independent twist beam in the rear. Suspensions are on the stiffer side and low bumps and pot holes are not the friendliest things to drive on with this car. Noise from the suspensions lets you know you are driving on a bad path. Suspension Damping is not the best we have seen from Tata. Surprisingly the driver didn’t feel strained much at all after a 150 km, non stop drive. Thanks to the easily adjustable seat height and adjustable steering setup. You get ample headroom even at the highest setting of the seat height adjustment. Me being a 6 footer didn’t face any problems with the head room. Hop into the rear and the leg room is amazing. Very good job by Tata for not compromising on this, despite the Tiago being a small city car. Three people would have to squeeze into the rear but its best for two people to sit comfortably. 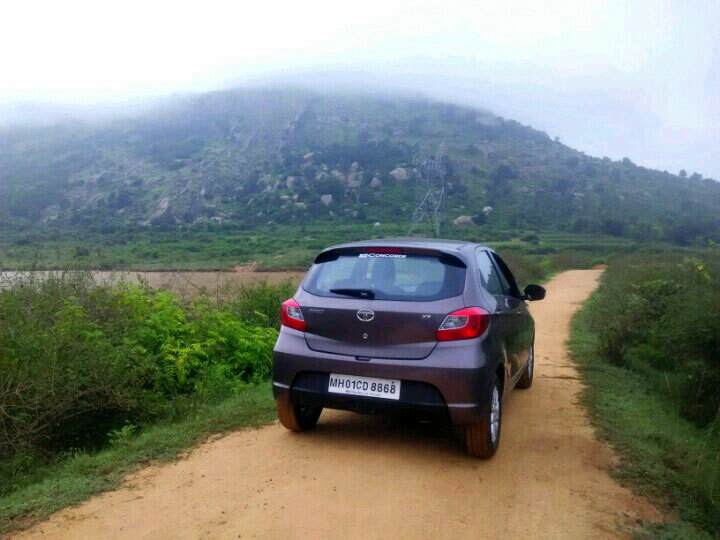 Tiago is best suited for city driving and if you would wanna take it out on the highway once in a while, the car welcomes you with wide arms. 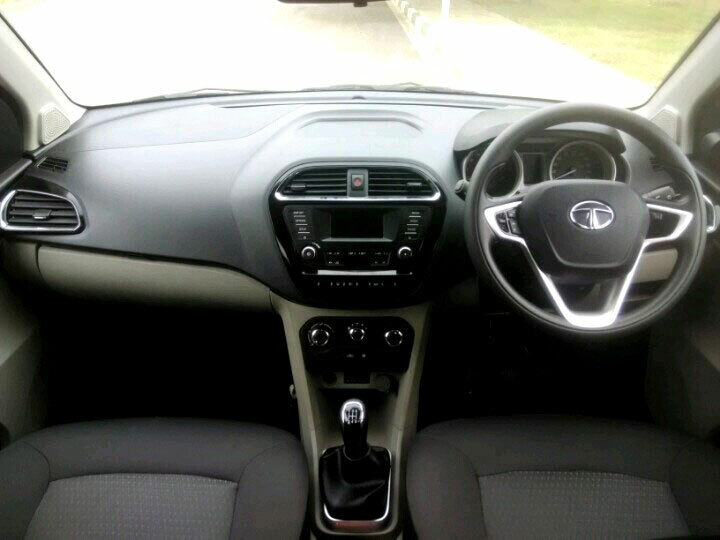 Tata has gone places with this car and we see the car going places with whats in it. Tiago is unlike anything Tata has ever done and with an impressive job like this, its a real good comeback. Its hard to ignore a car like this especially when its competing against cars like the Maruti Suzuki Celerio and the Hyundai Grand i10. Tata Tiago comes in 18 versions with two fuel options with a price range of Rs 3.33 lakhs to Rs 5.8 lakhs (ex showroom Bangalore). Write to us at reach@gaadikey.com for any enquiries. You can also like us on Facebook and subscribe to our Youtube channel for more updates.